Gujarat lies 300–400 km from the plate boundary between the Indian Plate and the Eurasian Plate, but the current tectonics are still governed by the effects of the continuing continental collision along this boundary. During the break-up of Gondwana in the Jurassic, this area was affected by rifting with a roughly west–east trend. During the collision with Eurasia the area has undergone shortening, involving both reactivation of the original rift faults and development of new low-angle thrust faults. The related folding has formed a series of ranges, particularly in central Kutch. The focal mechanism of most earthquakes is consistent with reverse faulting on reactivated rift faults. The pattern of uplift and subsidence associated with the 1819 Rann of Kutch earthquake is consistent with reactivation of such a fault. The 2001 Gujarat earthquake was caused by movement on a previously unknown south-dipping fault, trending parallel to the inferred rift structures. The death toll in the Kutch region was 12,300. Bhuj, which was situated only 20 km away from the epicentre, was devastated. Considerable damage also occurred in Bhachau and Anjar with hundreds of villages flattened in Taluka of Anjar, Bhuj and Bhachau. Over a million structures were damaged or destroyed, including many historic buildings and tourist attractions. The quake destroyed around 40% of homes, eight schools, two hospitals and 4 km of road in Bhuj, and partly destroyed the city's historic Swaminarayan temple and historic fort as well Prag Mahal and Aina Mahal. The Indian National Trust for Arts and Cultural Heritage (INTACH) inspected more than 250 heritage buildings in Kutch and Saurashtra and found that about 40% of them are either collapsed or seriously damaged. Only 10% were undamaged. In Ahmedabad, Gujarat's commercial capital with a population of approximately 7 million (according to data in 2018), as many as 50 multi-storey buildings collapsed and several hundred people were killed. Total property damage was estimated at $7.5 billion. In Kutch, the earthquake destroyed about 60% of food and water supplies and around 258,000 houses, 90% of the district's housing stock. The biggest setback was the total demolition of the Bhuj Civil hospital. The Indian military provided emergency support which was later augmented by the International Federation of Red Cross and Red Crescent Society. A temporary Red Cross hospital remained in Bhuj to provide care while a replacement hospital was built. Four months after the earthquake the Gujarat government announced the Gujarat Earthquake Reconstruction and Rehabilitation Policy. The policy proposed a different approach to urban and rural construction with the estimated cost of rebuilding to be US$1.77 billion. The main objectives of the policy included repairing, building, and strengthening houses and public buildings. Other objectives included the revival of the economy, health support, and reconstruction of the community and social infrastructure. The housing policy focused on the removal of rubble, setting up temporary shelters, full reconstruction of damaged houses, and the retrofitting of undamaged units. The policy established a community-driven housing recovery process. The communities affected by the earthquake were given the option for complete or partial relocation to in-situ reconstruction. The total number of eligible houses to be repaired was 929,682 and the total number of eligible houses to be reconstructed was 213,685. By 2003, 882,896 (94%) houses were repaired and 113,271 (53%) were reconstructed. The Environmental Planning Collaborative (EPC) was commissioned to provide a new city plan for the city of Bhuj. The plan focused on creating a wider roadway network to provide emergency access to the city. The EPC used land readjustment (LR) in the form of eight town planning schemes. This was implemented by deducting land from private lot sizes to create adequate public land for the widening of roadways. The remaining land was readjusted and given back to the original owners as final plots. U.S. Air Force personnel preparing relief supplies on Feb. 3, 2001. In order to support the reconstruction and rehabilitation of the city, the Government of Gujarat created four assistance packages worth up to US$1 billion. These packages assisted about 300,000 families. The government also announced a US$2.5 million package to revive small, medium, and cottage industries. The World Bank and the Asian Development Bank also provided loans worth $300 million and $500 million respectively. Assistance was offered from many countries and organisations. Smritivan, a memorial park and museum dedicated to victims of the earthquake was built on top of Bhujia Hill. 13,823 trees, each dedicated to a victim, were planted in the garden and 108 small water reservoirs were created on the hill. ^ NGDC. "Comments for the Significant Earthquake". Retrieved 27 January 2011. ^ a b Ray, Joydeep (16 April 2004). "Gujarat to set up quake memorial in Bhuj". Business Standard. ^ Gupta, HARSH K., et al. "Bhuj earthquake of 26 January 2001." JOURNAL-GEOLOGICAL SOCIETY OF INDIA 57.3 (2001): 275–278. ^ "15 years of Gujarat earthquake: A trauma etched in Gujarat's memory – Times of India". The Times of India. Retrieved 19 May 2017. ^ "Preliminary Earthquake Report". USGS Earthquake Hazards Program. Archived from the original on 20 November 2007. Retrieved 21 November 2007. ^ Sen, Kavita. "Economic consequences of the Gujarat earthquake". ^ Maurya, D. M.; Chowksey, Vikas; Patidar, A. K.; Chamyal, L. S. (2017). "A review and new data on neotectonic evolution of active faults in the Kachchh Basin, Western India: legacy of post-Deccan Trap tectonic inversion". Geological Society, London, Special Publications. 445 (1): 237–268. Bibcode:2017GSLSP.445..237M. doi:10.1144/sp445.7. ^ Bodin, P.; Horton S. (2004). "Source Parameters and Tectonic Implications of Aftershocks of the Mw 7.6 Bhuj Earthquake of 26 January 2001" (PDF). Bulletin of the Seismological Society of America. Seismological Society of America. 94 (3): 818–827. Bibcode:2004BuSSA..94..818B. doi:10.1785/0120030176. Retrieved 2 April 2012. ^ Li, Qingsong; Liu, Mian; Yang, Youqing (17 March 2013). "The 01/26/2001 Bhuj, India, Earthquake: Intraplate or Interplate?". Plate Boundary Zones. American Geophysical Union. pp. 255–264. doi:10.1029/gd030p0255. ISBN 978-1-118-67044-6. ISSN 2329-1540. ^ Rabindra, Vasavada; Edmund, Booth (2001). "Effect of the Bhuj, India earthquake of 26 January 2001 on heritage buildings". Beiträge zur Allgemeinen und Vergleichenden Archäologie. 21. ISSN 0170-9518. ^ Eidinger, John M. (1 January 2001). 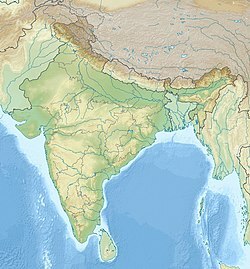 Gujarat (Kutch), India, M7.7 Earthquake of January 26, 2001, and Napa M5.2 Earthquake of September 3, 2000. ASCE Publications. ISBN 9780784475065. ^ a b Jha, Abhas K. (15 January 2010). Safer Homes, Stronger Communities: A Handbook for Reconstructing after Natural Disasters. World Bank Publications. ISBN 9780821382684. ^ Jha, Abhas K. (15 January 2010). Safer Homes, Stronger Communities: A Handbook for Reconstructing after Natural Disasters. World Bank Publications. ISBN 9780821382684. ^ a b c d Sinha, Anil (2003). "The Gujarat Earthquake 2001" (PDF). Asian Disaster Reduction Center. Asian Disaster Reduction Center. Retrieved 20 July 2016. ^ a b c Byahut, Sweta (Fall 2014). "Post-Earthquake Reconstruction Planning Using Land Readjustment in Bhuj (India)". Journal of the American Planning Association. 80 (4): 440. doi:10.1080/01944363.2014.989132 – via Academic Search Complete. ^ Byahut, Sweta; Mittal, Jay (2016). "Using Land Readjustment in Rebuilding the Earthquake-Damaged City of Bhuj, India". Journal of Urban Planning and Development. 143: 05016012. doi:10.1061/(ASCE)UP.1943-5444.0000354. Wikimedia Commons has media related to 2001 Gujarat earthquake.